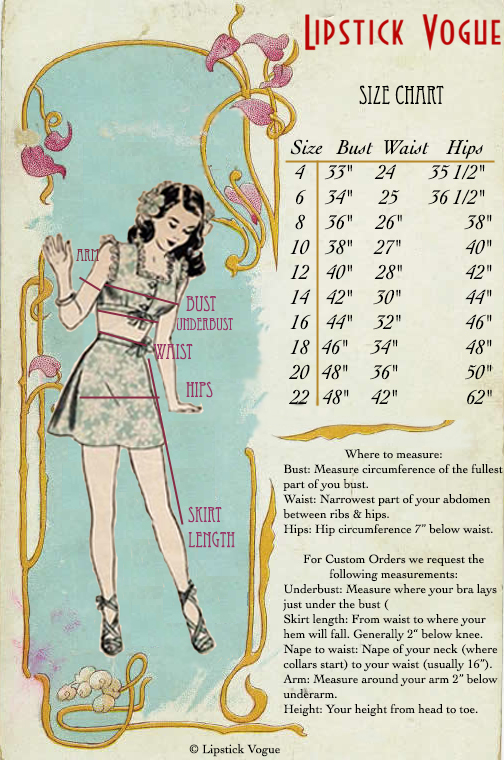 Please note: If you are unsure how to measure yourself, you can always go to a local tailor and ask them to measure you, especially if you will be custom ordering a dress because you can get more accurate and complete measurements. Our sizing follows misses sizing for sizes 4-14 and grades into women’s sizing for sizes 16-20. Our dress sizing is cut more “hourglass” which means it will be snug at the waist and more full at the bust and hips. If you are having trouble finding exactly where your waist is, just measure one inch above your navel. Unless noted, our pieces have no stretch so you are better going a size up than a size down. Also good to note, if you’re trying to determine your size, make sure you’re comparing your size only to the measurements listed, not based on another brand’s sizing because one brand’s 4 is another’s size 8. We can exchange sizes if your dress doesn’t fit as expected. In some rare cases we may decide to charge a restocking fee.